It is pleasant to spend time with him, to lie close to his breast like the Beloved Disciple and to feel the infinite love present in his heart. If in our time Christians must be distinguished above all by the “art of prayer”, how can we not feel a renewed need to spend time in spiritual converse, in silent adoration, in heartfelt love before Christ present in the Most Holy Sacrament? How often, dear brother and sisters, have I experienced this, and drawn from it strength, consolation and support! When you look at the crucifix, you understand how much Jesus loved you. When you look at the Sacred Host you understand how much Jesus loves you now. It is our duty to adore the Blessed Sacrament. No one receives the Blessed Sacrament unless he adores it...and not only do we not sin by adoring, we do sin by not adoring.To fall in love with God is the greatest of all romances; to seek Him, the greatest adventure; to find Him, the greatest human achievement. Each time you approach the Blessed Sacrament remember that Jesus has been waiting for you for twenty centuries for this personal visit from you. The unique and indivisible existence of the Lord glorious in heaven is not multiplied, but is rendered present by the sacrament in the many places on earth where Mass is celebrated. And this existence remains present, after the sacrifice, in the Blessed Sacrament which is, in the tabernacle, the living heart of each of our churches. And it is our very sweet duty to honor and adore in the blessed Host which our eyes see, the Incarnate Word whom they cannot see, and who, without leaving heaven, is made present before us. 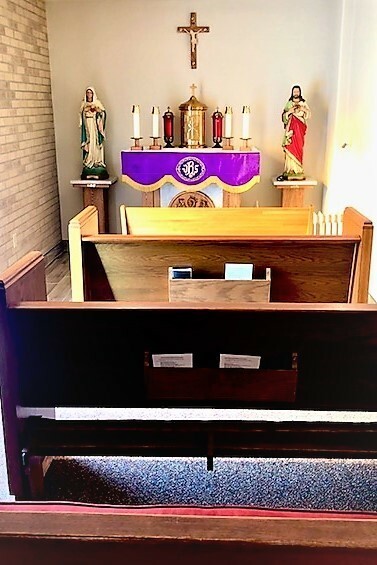 Adoration is held in the Mary, Mother of God Chapel, which is accessible through the southeast entrance of the Church. We hope to add more days and times for adoration as more people sign-up. If you are willing to commit please do so either by signing up below or calling Clarine Sandstrom at (701) 390-4286 or Zach Wald at the parish office. To sign up for adoration online click the link below. You will be taken to a Google document that displays all the times at which adorers are still needed. If you see a time you would like to sign-up for type your name and phone number in the appropriatate time slot. We will then contact you to confirm that you signed up and to provide you with any more needed information. For now, we are hoping to have adoration daily Mon-Fri. If you do not want to commit to a weekly hour at this time, but would like to be included in the list of substitutes enter your name and phone number under the title substitute. If you would prefer to provide a range of times to in which you would be interested in adoring please fill out the form below. Note: Signing up for an adoration time does not mean there will be adoration at that time. We need a least a few hours in a row before we will add more times. The times at which adoration will be held will be highlighted in blue. We will provide information on the website and in the bulletin concerning the addition of new times and those who signed up for the new times will be contacted. Further, removing your name from the online sign up document does not mean that you are no longer signed-up. If you need to change your hour or can no longer commit to a weekly hour please contact Zach Wald at the parish office. List times you would like to adore in the boxes below. Monday Please enter valid data. Tuesday Please enter valid data. Wednesday Please enter valid data. Thursday Please enter valid data. Friday Please enter valid data.